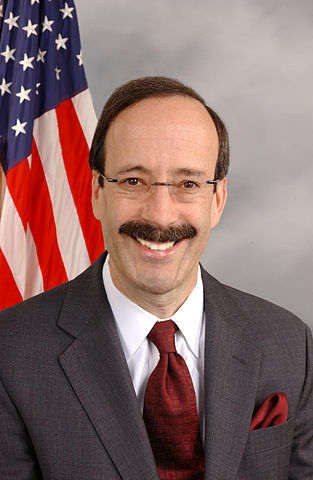 Eliot L. Engel is a Jewish American politician who currently serves in the U.S. House of Representatives for New York. Engel was born in Bronx County on February 18, 1947. He grew up in a city housing project and attended New York City public schools. In 1969, he graduated from Hunter-Lehman College with a B.A. in History and received a Master's Degree in Guidance and Counseling in 1973 from Herbert H. Lehman College of the City University of New York. In 1987, he received a law degree from New York Law School. For the twelve years prior to his election to Congress, Mr. Engel served in the New York State Legislature (Assemblyman, 1977-1988), where he chaired the Assembly Committee on Alcoholism and Substance Abuse, as well as the Subcommittee on Mitchell-Lama Housing. Prior to that, he was a teacher and guidance counselor in the New York City public school system. Engel is a Democrat and represents the 17th Congressional District covering areas of the Bronx and lower Westchester County. He was first elected to Congress in November 1988. He has repeatedly won reelection, most recently in 2018. During his political career, Engel has authored landmark housing and education legislation, led battles for increased funding in the war against drugs, and is recognized as a leading advocate for improved mental health services. As a member of Congress, he has written innovative bills dealing with U.S. trade policy, education reform, and long-term health care. He was the prime sponsor of the Congressional resolution recognizing Jerusalem as the undivided capital of Israel, and he wrote the bill designating October as Italian American Cultural and Heritage Month. A life-long resident of the Bronx, Congressman Engel is married to Patricia Ennis Engel. They have three children, Julia, Jonathan and Philip.